The Northeastern Section of the American Chemical Society is pleased to announce that Prof. Peter Mahaffy is the recipient of the 2011 James Flack Norris Award for Outstanding Achievement in the Teaching of Chemistry. Within the classroom, Mahaffy is known for his highly effective and innovative teaching methods including his commitment to helping students, educators, scientists, and the general public to observe the intricate connections between science and their everyday lives. 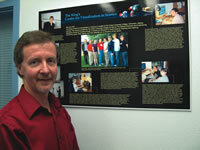 Mahaffy was instrumental in establishing and co-directing the King’s Centre for Visualization in Science which has allowed him to continue his development of digital learning resources that help learners see and understand scientific concepts that would otherwise be difficult to visualize. Each month, over 10 000 learners from over 70 countries contribute to their chemical understanding by visiting <www.kcvs.ca> where they access information on topics ranging from elementary science to chemistry, physics, and climate change science. During the International Year of Chemistry, Mahaffy has interacted with and learned from chemists and educators from around the world, observing the imaginative solutions they bring to the many challenges faced by scientists. The award will be formally presented to Mahaffy at the 10 November 2011 meeting of the Northeastern Section.